Londonderry’s Jessica Choate accepted a handmade bracelet from third-grader Madison Rinkin Friday morning during a special farewell ceremony held at North Elementary School. 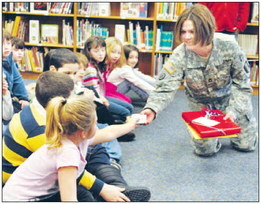 LONDONDERRY -- Staring into the earnest faces of her two children’s 500 or so peers Friday morning, Staff Sergeant Jessica Choate prepared to say farewell, for now, to her day-to-day life as a mom. Choate, a member of the U.S. Army’s 368th Combat Engineers Battalion, was met with applause, gratitude and tears when she visited North Elementary School Friday, one day before being deployed to Afghanistan. From then until sometime in spring 2012, Choate will communicate with her children, Sam, 9, and Shauna, 10, by mail or e-mail as her mother, Pam Williams, temporarily takes over their daily activities. Though the coming months will prove challenging for the family, Choate, who returned from a deployment in Iraq in October 2009, said she and her family were grateful for the support being offered up, yet again, by the North School community. Choate, who learned of her pending deployment months in advance, waited until summer had passed to break the news to her children, wanting them to be able to relax and enjoy their vacation and their time spent together. Once she arrives in the Middle East, Choate said she will communicate with her family as often as possible and send small token gifts to her children whenever she gets a chance. During Choate’s previous deployment, the staff at North School banded together, offering to assist the family in any way needed, Principal Mary Coltin said. She noted that Richard Zacchilli, the school’s former principal, proved to be a very important figure in the family’s lives. Wanting to show their gratitude, Choate, her mother and her brother, Jason Williams, stopped by the school yesterday to dedicate a special plaque to Zacchilli, which was posted in the school library, near some colorful murals painted by Jason Williams. Unbeknownst to Choate, the students and staff had a few surprises in store. As Choate and her family made their way through the school hallways, students and staff members left their classrooms and stood at attention along the walls, wearing their best red, white and blue outfits and waving American flags while “Proud To Be An American” played over the intercom. As she passed through the halls, Choate’s arms overflowed with carnations and crayon drawings gifted to her. She wiped away tears while many stretched out their arms to embrace her. Arriving at the school library, Choate was presented with a flag that had once flown over the New Hampshire State House. There were a couple of minutes for Choate to answer some of the children’s questions, questions that reflected the innocence of youth. “Is it hard over there?” one little girl asked. “It can be,” Choate told her. “Why is there a war, anyways?” another child asked. “You are the heroes, too, you know that?” Choate told her two children as she waved farewell. “Thank you everybody, I’ll see you in a year. No running in the hallways, okay?” she told the students in the crowd. Motioning to a huge sign hanging in the library, Coltin gave Choate a big hug, reminding her the words on the sign will always ring true. “You are taking a piece of our hearts over there with you,” she told her.